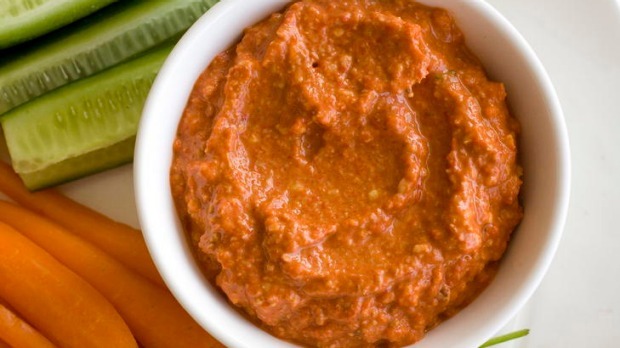 Combine capsicums, chilli and garlic in a food processor and whiz until smooth. Add walnuts, lemon juice and pomegranate molasses then process again. Season with a little pepper and salt. Serve with raw vegetable crudites, such as baby carrot, radish, zucchini flowers, cucumber and celery. Nutrition per serve: protein, 1.8 grams; fat, 4.4 grams (saturated, 0.3 grams); carbs, 2.4 grams; kilojoules, 235. Gluten free, low GI.